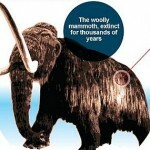 Weird Things » Blog Archive » Woolly Mammoths By 2015? One man is on a mission to bring woolly mammoths back from the dead. A technique for successfully recovering frozen cells to use in creating clones was pioneered in 2008 by Dr. Teruhiko Wakayama, of the Riken Centre for Developmental Biology. Now Akira Iritani, a professor at Kyoto University, plans to use the results in a quest to bring the woolly mammoth back to life. Professor Iritani estimates about 2 years to successfully implant an embryo into an elephant, followed by a 600-day gestation period. He will be travelling to Siberia this summer in search of specimens. I want Jurassic Park NOW. did they not learn from jurassic park???? fail!!! As long as they ain’t meat eaters, I don’t care.